Tsurumi C-series pumps are heavy-duty, submersible cutter pumps for sewage and wastewater, which are made of castings and equipped with cutting mechanism. Featuring a combination of impeller vane with brazed sintered tungsten carbide alloy edge and a suction cover of serrated shape, the C-series pumps enable smooth pumping, while cutting fibrous foreign objects during suction. These pumps have been used to drain sewage and wastewater from buildings and kitchens, and to transfer sewage and wastewater in water treatment facilities of factories and commercial complexes. The C-series comes in a wide product lineup, covering discharge bore diameters of 50 to 200 mm and motor outputs of 0.75 to 37 kW. Among the C-series pumps, “CR” models are available as highly-durable cutter pumps, whose impeller and suction cover are made of high-chromium cast iron as a standard feature. All models of the C-series can be used in combination with a guide rail fitting device that enables easy installation and maintenance. In addition, a new model of dry pit type is optionally available. The dry pit type pump can be installed indoors, and outside a tank. With Tsurumi’s original specifications for dry pit, the dry pit pump delivers the performance of conventional submersible pumps in a variety of sites. These pumps integrate original technologies that Tsurumi has researched and proven in the field over many years, such as anti-wicking cable, dual inside mechanical seals with silicone carbide face and Oil Lifter, etc. Furthermore, durability and wear resistance have been thoroughly considered in their design, so these pumps enable continuous duty over long periods of time. Tsurumi products are designed to provide excellent durability and sound quality, thus contributing to the stable operation of facilities and enabling a considerable reduction in maintenance cost. The cutter pump mechanism comprises a combination of impeller vanes with single or two brazed sintered tungsten carbide alloy edge and a suction cover of serrated shape. The front surface of the suction cover has numerous grooves that catch fibrous matter, which is then shredded by the tungsten carbide alloy edges of the impeller vanes and the saw teeth of the suction cover. 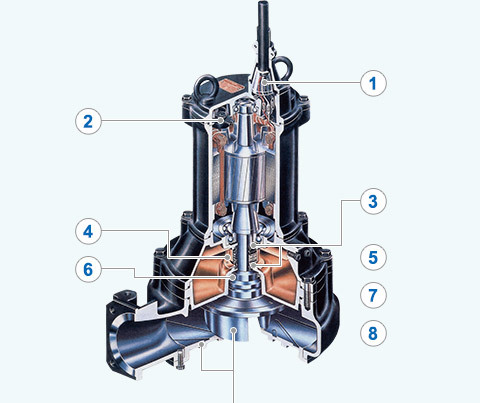 This mechanism prevents the pump from being clogged with fibrous matter that can easily clog any pump. Circle Thermal Protector (7.5kW and below) Directly cuts the motor circuit if excessive heat builds up or overcurrent occurs in the motor. Miniature Thermal Protectors (11kW and above) React to excessive heat caused by dry-running. The bimetal strip opens to cause the control panel to shut the power supply. Isolated in the oil chamber where a clean, non-corrosive and abrasion-free lubricating environment is maintained. Compared with the water-cooled outside mechanical seal, it reduces the risk of failure caused by dry-heating and adhering matter. The silicon carbide provides 5 times higher corrosion, wear and heat resistance than the tungsten carbide. Rubber parts of the upper and lower fixing rings are made of NBR or FPM (FKM), which provides higher resistance to heat and chemicals. Float Type (80C215-CR and 100C222-CR) Electrode Type (200C437-CR) Detects flooding into the incursion water storage chamber and oil chamber that may occur in a worst case scenario. When flooding is detected, signals are sent to operate the indicator lamps through the external control panel. Protects the mechanical seal from pump pressure. It also protects the seal face by discharging wear particles. and reduction in maintenance labor. As a special option of the Tsurumi C-series cutter pumps, dry pit specifications are available. The dry pit pumps have been designed to drain wastewater from buildings, in which a mixture of all kinds of sewage and wastewater is expected. The dry pit pumps can be installed indoors and outside of tanks, and still deliver the performance of conventional submersible pumps. Daily inspection and maintenance are easy, because the pump body is installed indoors. These pumps have been developed with Tsurumi-original specifications, aiming for stable operation and reduction in maintenance labor. Of course, the dry pit pumps inherit the anti-wicking cable, dual inside mechanical seals with silicone carbide faces on the sides that are not in contact with wastewater, and Oil Lifter from Tsurumi’s submersible pumps. In addition, they are designed with the maximum consideration for high-temperature resistance, with bearing grease for high temperature use, class H insulation, a leakage sensor, mechanical seals made of FPM (FKM), and high-grade lubricating oil as standard specifications. As described above, Tsurumi’s dry pit pumps feature a high quality, highly-reliable design that ensures excellent durability and high wear resistance. They can be installed in a variety of sites and will help keep facilities operating stably and will remarkably reduce maintenance costs.